In the paper are reported the results obtained from a number of trials that were carried out in order to evaluate the behaviour of wet magnetic fluorescent particles, employed in stationary test equipment, taking into consideration the decrease of their performances due to use and time according to several standards. The behaviour of the particles had been investigated both in a qualitative and in a quantitative way. Qualitatively, by employing new and used particles on the same natural selected faults, had been obtained different results. Quantitatively, by means of a photofluorimeter, employed in a suitable way, the decrease of fluorescence of the commonly employed particles after a long exposition to the U.V. radiation had been measured. Finally the increase of fluorescence of the liquid vehicle (oil) was measured owing to the time of use. Following to the experimental results, it is evident the necessity to optimize specific evaluation procedures to characterize the fluorescent particles, particularly as regards their resistance to a long exposition to U.V. radiation, the increase of fluorescence of the liquid vehicle by the time of use and the characteristics of equipment that have to be used to carry out fluorescence measurements. The continual development of production processes and the constant expansion of market boundaries have recently determined the need for constant verification of high technology components, aimed to obtain reliable, technically suitable and economically competitive products on both national and international markets. Among these, the Non Destructive Testing method with Magnetic Fluorescent Particles constitutes one of the most widespread techniques used for the examination of surface's integrity of many industrial components. The wide range of products available on the market makes it undoubtedly possible to do the right technical-economical choices, in order to meet specific case requirements, but on the other hand it requires that the qualitative characteristics of the products be constantly verified, so that the operative test specifications could be fully met. In particular, the qualitative and quantitative evaluation of the Magnetic Particles' Fluorescence is extremely important, because these characteristics have a considerable effect on the indications and, consequently, on the reliability of inspections. In this regard, and especially in cases in which the Magnetic Particle Testing have to be carried out on components that must assure a high degree of preventive safety for man and the environment (eg. Aircraft, Space, Petrochemical, Nuclear industries, etc. ), the national and foreign technical standards, which cover the requirements for the correct application of this non-destructive examination method, provide some indications to evaluate Fluorescence's characteristics. The results obtained from the examinations are generally evaluated and compared, as percentages, with those obtained from the similar examinations carried out with other products, initially chosen as the master standards. However, although the need for this kind of examination technique on new products or on subsequent supplies of the same product is widely accepted, it is believed that clarification should be provided on the apparatus to use for evaluating Magnetic Fluorescent Particles. As regards, particularly for the "Wet Magnetic Fluorescent Particles", the method reliability depends on many variables that directly indirectly affect the results (e.g. the characteristics of the media products, the characteristics of the equipment used during the examination, the characteristics of adhesion between the fluorescent bond on the particles, the stability of the fluorescent products under U.V. exposition, etc.). 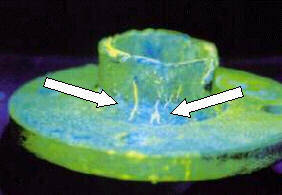 In this case, an excessive fluorescent coloration of the fluid vector may generate on surface under examination a very background noise, with consequently alteration of defect indications. The aim of these experimental activities is to produce results which, besides being utilized to the advantage of Manufacturing and Service Industries alike, can constitute an useful support to all the Technical Bodies that work to draw up the national and international standards in the field of non-destructive Examinations. One of the major requirements of the Working Groups working towards the definition of National, European and International Technical Standards, is the availability of results obtained from experimental activities undertaken to substantiate the subject matter in question. These requirements are particularly important for cases in which the standards currently in being and/or being defined or subject to amendments, directly or indirectly affect the acceptance criteria of products and equipment available on the market. In order to value the quantitative and qualitative incidence of the Fluorescence background's increasing during the Wet Magnetic Particles inspection on the reliability of the results, has been conducted an experimental research in collaboration among ENEA (Energy Centre Research), Italian Institute of Welding and NDT Italiana Society. The results carried out during the experimental analysis, has been used to verify the technical suitability and functional reliability of instrumentation that provide relative fluorescence measurements, in order to determine whether it can be used to carry out the examinations specified by many standards in this sector. Particularly, the experiments are extended to verify if the Photofluorimeter NDT-S291 mentioned in the ASTM-E-1135, which provides relative fluorescence measurements of Fluorescent Penetrants, can constitute a valid equipment for periodic testing of the Wet Magnetic Fluorescence Particles; as regards, this paper describes the principal results carried out, that can be used directly by manufacturing industries and the service society as regards the control of the inalterability of the Wet magnetic fluorescent particles. During the definition and preparation of the analyses necessary for a correct evaluation of the fluorescence's alterability of the wet magnetic particles, a particular attention has been applied to obtain really utilizable results by manufacturing and service industries; as regards, have been used different natural defected samples, having known characteristics of the flaws. The examinations were conducted adopting some different standards, e.g. MIL-STD-1949, DOD-F-87935, Rolls-Royce Specification-RPS.700, etc., frequently used in the Aircraft and Space Industries. For maximum reliability and fairness of the results, several operators in separate locations, who ignored the results obtained by the others, conducted the analyses with different products. Furthermore, each item of product used in the experiment was taken from the same sealed package; as regards, the product identification parameters were removed from the packages so as to permit fair and just evaluations. 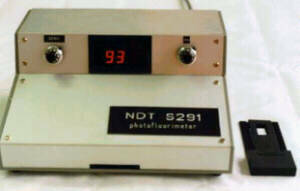 It was asked the NDT Italiana Society, as instrument manufacturers, to collaborate; in addition to providing the equipment, to carry out the Fluorescence's measurements, the manufacturers also furnished the operating procedures for the Photofluorimeter and the necessary information regarding all the constructive characteristics that could be directly or indirectly correlated to the results of the analyses. This necessity is justified by the fact that one of the essential requirements for equipment competitiveness is, besides its measurement precision and reliability, its simplicity of use; in fact, if highly specialized personnel is required to correctly operate the instrument, then the running costs would be extremely high despite the attainment of precise, reliable and repeatable results. The experiments conducted to verify the Fluorescence's characteristics of the Wet Magnetic Particles' were carried out at laboratories of ENEA (Energy Centre Research), of Italian Institute of Welding and of NDT Italiana Society. Some information is provided herein regarding the test samples under examination, the methods of analysis, the criteria used to evaluated the results and the constructive and functional features of the Photofluorimeter used for the Fluorescence test. The samples employed in the comparative analyses of sensibility were characterized by following defects: hot cracks, cold cracks, heat treatment cracks, tension-corrosion cracks and fatigue cracks. 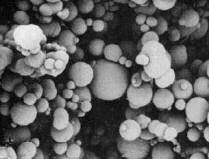 During the analysis Wet Magnetic Fluorescent Particles of four different manufacturers, mentioned in the present document as "A", "B", "C" and "D", presenting two different powders dimension (2-5 m m and 5-10 m m) with oil-base fluid; Fig.1 shows as an example the images of some particles enlarged by optical microscope. Special magnetizing bench, was used with the possibility to utilize different kinds of alternate and rectified current. To verify the inalterability of fluorescence under ultraviolet exposition, a 100W U.V. lamp with separate Wood Filter was used with a radiometer type UVR-365 and a luxmeter type LUX-MET. 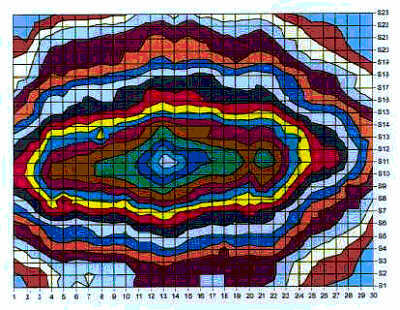 Fig.2 shows the U.V. light characterization of the black VNC lamp, as luminous mapping on orthogonal plane at the radiant beam. To measure the fluorescence intensity was used the S291 Photofluorimeter mentioned in the ASTM-E-1135 for Fluorescent Penetrants (Fig.3), opportunely modified as showed in Fig.4/A and 4/B and calibrated to allow during the aging test both the magnetic particles fluorescence and the liquid fluorescence. Evaluation of the fluorescent intensity of new products and/or new supplies of the same product. Evaluation of fluorescence after a long exposure to ultraviolet light. Evaluation of the fluorescent stability after aging test of the products. Before to begin the tests, several components and characteristics of the Photofluorimeter were verified. In particular, a monochromator with measuring capability in the 200-800·nm range was used to evaluate both the ultraviolet light emission spectrum of the U.V. lamp of the Photofluorimeter and its transmission spectrum of filters. As regards, the results obtained have emphasised that the maximum U.V. emission, about 99%, occurs at 366 nm wavelength; this condition is one of the most favourable for activating Fluorescence, as an excitation wavelength of 365 nm is usually required. Subsequently, some analyses have been conducted to evaluate the magnetic particles' fluorescence after a long exposition to U.V. radiation; in fact, especially using the fixed magnetizing equipment, the magnetic particles are continuously exposed to the U.V. radiation during the normal work cycles. As regards, some samples of Dry Magnetic Fluorescent Particles have been evaluated before and after two hours of U.V. exposition, at 1000 m W/cm2 of intensity measured on the test surface. Fig.5 shows a considerable difference of the results obtained for particles of same dimension but different manufacturers, using traditional Photofluorimeter. It is possible to have other information on the light exposition effects on the Magnetic Particles' Fluorescence by Fig.6, that shows decreasing of fluorescence after 24 hours at white light exposition in the storage conditions. As regards some solutions of each product under examination was prepared, and successively used for a period of 400 hours (about 50 working days). At 24 hours regular intervals, some samples of batch were drawn, and the Magnetic Particles separated by means of a Permanent Magnet. The fluorescence measurements were obtained by means of traditional Photofluorimeter for Dry Magnetic Particles (see sketch Fig.4/A), and by means of modified instrument (see sketch Fig.4/B) for Liquid. Results carried out during measurements show clearly the difference among the products under examination and the product initially chosen as reference standard. Particularly, Fig.7 shows the decreasing of Magnetic Particles' Fluorescence after 400 hours of working time, while Fig.8 shows the increasing of Liquid's Fluorescence on the same working conditions. Then, to verify quantitatively the effects of the products' aging on the complete sensitivity of the NDT process, have been used some natural defected samples. After 400 running time hours, some products could be still used, while other products weren't able to evidence some particular defects. Figures 9/A and 9/B show only an example of the decreasing on indications' seeability that, surely, is able to reduce the general sensitivity of the test. The problem of Magnetic Particles' Fluorescence measurements is of primary importance in the Non Destructive Testing field, especially when critical components employed for aerospace, petrochemical or nuclear industries have to be examined. As regards, the reliability of the Fluorescence's measurements depends on the test procedure and, particularly, on the constructive and functional characteristics of the instrument used during the analyses. In order to value the quantitative and qualitative incidence of the fluorescence background's increasing of liquid used during the Wet Magnetic Particles Testing, has been conducted an experimental research in collaboration with ENEA (Energy Center Research), IIW (Italian Institute of Welding) and NDT Italiana Society. Results carried out at the end of the research show clearly a considerable difference among products of different manufacturers referred to a product initially chosen as reference standard. Particularly, a considerable decreasing of the Fluorescence, measured on new dry Magnetic Particles, was proved after long U.V. radiation and white light exposition. Besides, during the aging tests of Wet Magnetic Fluorescent Particles, the remarkable increasing of liquid's fluorescence in some kinds of products prevents the seeability of fluorescent indications emitted by some particular defects and, consequently, reduces the general sensitivity of this method of analysis. Nevertheless, in general, needs a particular attention the fact that, for different products with the same dimensions, there is a strict relation between the fluorescence's decreasing of the dry magnetic particles and the increasing of liquid's fluorescence (background) during aging tests. Finally, all the results, carried out during the experimental research show the technical suitability and functional reliability of Photofluorimeter NDTS291, mentioned in the ASTM-E-1135 to compare different Fluorescent Penetrants, also to verify the Fluorescence's characteristics of Magnetic Particles. 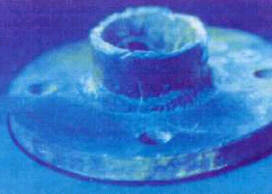 Non Destructive Examination with Liquid Penetrants. Edition of the Italian Institute of Welding.